Hebert Mallqui’s three year-old daughter Carmen has Down syndrome and a heart condition, but he overstayed his visa and the Trump administration now has ‘zero tolerance’ for such cases. Pastor Hebert Mallqui never dreamed of coming to the United States, until the day he was invited, almost 20 years ago. He was a single, 28-year-old, 7 thDay Adventist living in Lima, Peru when he was recruited to assist a pastor in Georgia for an evangelical mission. He arrived in 2002 on a five-year ‘R1’ visa for religious workers. Fast forward to 2019 and Mallqui is now married with three U.S.-born children, Luis, aged 12; Rosa aged eight; and Carmen, aged three. He leads a small congregation of 50 people in Valdosta, Georgia. But his life in the United States may be coming to an end. Last month he and wife Rubicella Aragon, received notice that they had 30 days to leave the country after their application for a visa extension was rejected by the Department of Homeland Security. “I’m worried about the future, but I’m trying to be strong,” said Mallqui. “If I was still single I’d have no problem. But I have a family, my children are caught in the middle,” he added. Mallqui’s problem stems from the fact that after several years in the United States his visa expired and he failed to legalize his immigration status. Several years passed. In the meantime, he left the 7 thDay Adventists and joined another church, the Christian Church (Disciples of Christ). After the birth of Carmen in 2015 he hired an immigration attorney who filed for ‘deferred action’, a discretionary process to avoid deportation, arguing that the family deserved to remain in the United States for humanitarian reasons. Carmen had been born with Downs Syndrome and an enlarged heart (cardiomegaly). The Department of Homeland Security (DHS) granted the request in November 2016 shortly after President Donald Trump’s election. Mallqui and his wife, who is from Chiapas, Mexico, were able to get jobs at a local Lowe’s Distribution Center. He worked days and his wife worked nights. Mallqui continued to minister to the church, while also being involved in a Christian soccer and basketball league, and a health fair. Last year, his lawyer, Elizabeth Ricci, filed for an extension. But, this time it was rejected. The January 18 rejection letter states that after ”careful consideration” DHS determined that ”when you submitted your request, you were present in the United States contrary to law”. The decision cannot be appealed. Ricci says she was not entirely surprised by the decision after the Trump administration’s implementation of a ‘zero-tolerance’ policy in cases of people who have overstayed their visa or are in the country illegally. “They approve only very strong cases. One officer told me that someone has to be knocking on death’s door to get approved,” she said. “It’s discretionary. I can have the exact two same cases that can go to two different officers. One can get an approval and another a denial. If we are a country of laws that doesn’t jive with that,” she added. If Mallqui is deported he will not legally be able to return to the country for 10 years. If he is put in removal proceedings he won’t be allowed to work even though it could take two to three years to deport him, unless he signs up for a voluntary departure, she said. Mallqui says he is at a loss for what to do and is figuring out how to settle his credit cards debts and rent. Carmen began attending a special school in October. His oldest son is attending Valdosta Early College Academy, a school catering to low income, first generation students with potential. “If we have to leave the country it would be a new beginning,” he said. “It makes me feel tense, and at night I have insomnia. But I have faith that things will turn out well,” he said. Most of all, he worries about Carmen’s medical treatment. “As a U.S. citizen they have given her the best attention. It won’t be the same,” he said. She has medical appointments and while her condition is improving, Mallqui says she still relies on regular doctors’ visits to monitor her heart. He’s not sure where they will go; maybe Mexico, maybe Peru. “I think it over a thousand times,” he said. He also worries about his congregation, many of whom depend on him for spiritual guidance, and practical day-to-day affairs. The Disciples of Christ counts about 3,400 congregations across the United States and Canada with a large Hispanic membership. 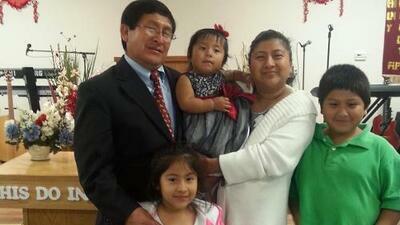 “Pastor Mallqui is an official minister in our church,” confirmed the church’s immigration counsel, Tana Liu-Beers. However, she said there was little the church could do for its minister beyond offering pastoral support. “His employment is between him and his congregation. He is not an employee of the church,” she said.